Playing the seventh Christmas Day game in franchise history—and their first since 1997—the Utah Jazz grabbed the lead midway through the first half and didn't let go, cruising to a 117-96 holiday victory over the Portland Trail Blazers Tuesday night in Salt Lake City. 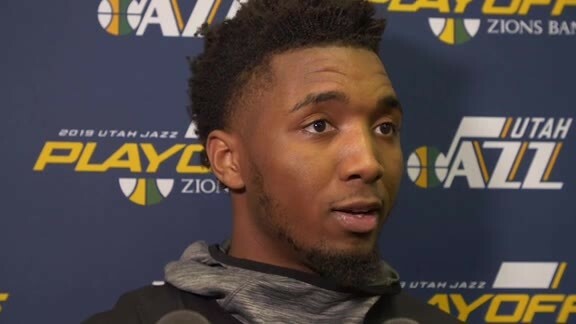 "It means the world to play on Christmas Day," Utah's Donovan Mitchell said. "As a kid I'd watch all the games on Christmas, and I did the same thing today. Then I had to lock back in and get ready to play." Mitchell was indeed locked in, leading the Jazz (17-18) with 19 points on 8-for-18 shooting. Rudy Gobert added 18 points, while Joe Ingles had 15 points and Ricky Rubio finished with 14 points and six assists. Gobert, Mitchell, Ingles and Rubio checked out of the game to a standing ovation with 2:04 remaining and the Jazz up by 15. Danté Exum tied his season high with 15 points (on 7-for-9 shooting) off the bench, while Jae Crowder (12 points) and Kyle Korver (10 points) also scored in double figures in the win. The Jazz have now blown out the Blazers twice in the last five days. They won 120-90 in Portland on Friday night. Damian Lillard led the Blazers (19-15) with 20 points. CJ McCollum had 11 points and Evan Turner added 12 points off the bench in the loss. Gobert was a force on both ends against the Blazers, finishing with 18 points and 14 rebounds for his 29th double-double of the season, which ranks second in the NBA behind only Philadelphia's Joel Embiid (30). The Stifle Tower also lived up to his nickname, swatting away a season-high seven shots. The Jazz are now 6-0 this season when Gobert blocks at least four shots. It was Gobert's fourth career game with at least seven blocks. 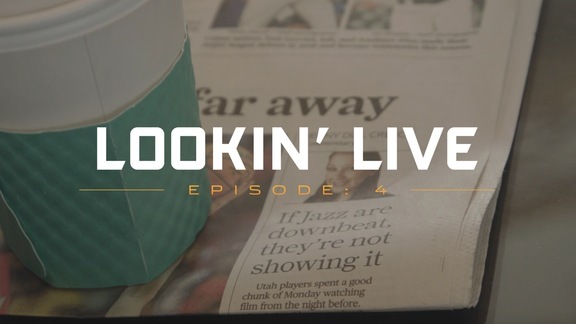 The Jazz jumped out to a 12-7 lead and set the tone midway through the first quarter with highlight-reel plays by Mitchell (a high-flying alley-oop dunk) and Gobert (an emphatic block followed by a transition dunk). Portland went ahead by two early in the second quarter, but the Jazz responded quick 9-0 run to take back the lead. Crowder scored seven of those points, while Ingles put in a scooping layup and Ekpe Udoh fueled the run with a block on the defensive end. The Jazz would go on to outscore the Blazers 35-23 in the quarter—thanks in large part to threes from Ingles, Crowder, Rubio and Mitchell—to take a 12-point lead into halftime. Back-to-back buckets by Rubio pushed the lead to 17 early in the third quarter, and the Jazz would maintain that margin until the opening minutes of the fourth quarter. Portland, though, went on a 11-2 run to cut that deficit to single-digits within two minutes. 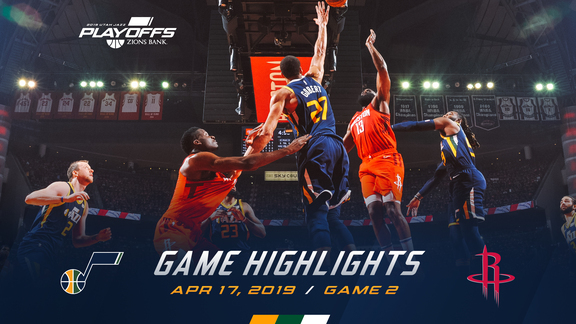 An offensive rebound by Derrick Favors and baseline layup by Exum gave Utah a jolt, and then a putback dunk by Gobert and a right-handed layup by Ingles forced a Portland timeout. The break, though, didn't stop Utah's momentum. 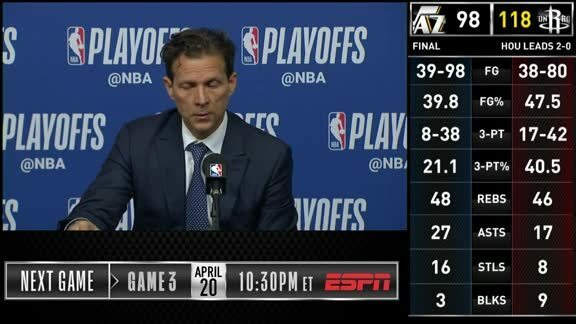 Gobert took a lob from Rubio and threw down an alley-oop dunk, Lillard air-balled a three, Rubio banked in a tough layup, and then Ingles and Mitchell canned back-to-back threes to push Utah's lead to 21 with 4:43 left to play. The Jazz missed their first eight 3-point attempts before shooting 13-for-21 (61.9 percent) the rest of the game. Ingles (3-for-5), Rubio (2-for-4), Korver (2-for-4), Mitchell (2-for-5) and Crowder (2-for-8) all made multiple threes. The Jazz would have had an even bigger lead at halftime if they hadn't shot so poorly from the free-throw line. They were 8-for-18 (44.4 percent) in the first half and 12-for-23 (52.2 percent) for the game. Lillard and McCollum combined for 31 points (17 below their combined season average) and shot only 13-for-35 (37.1 percent) from the floor. "Rudy's able to play all over the court. That's what we need from him. He can still protect the rim and also be impactful out on the floor. We've got to be able to protect him, too. When we do that, it puts him in positions where he can impact the game—not just plugging holes, but doing some of the things he did tonight." The Jazz debuted their green Earned Edition uniforms. ... Utah is now 8-3 this season when holding its opponent under 100 points. ... The Jazz-Blazers game capped off ESPN's five-game Christmas Day broadcast slate. ... Utah outscored Portland 58-46 in the paint. ... Lillard, who entered the night ranked fourth in the NBA in free throws made and eighth in free throws attempted, did not shoot a free throw. ... The Jazz shot 55.4 percent from the field. The Blazers shot 39.3 percent. The Jazz will remain home to host the Philadelphia 76ers on Thursday night. Tipoff is set for 8:30pm MT, and the game will be broadcast nationally on TNT.